Inserts are made of self-extinguishing thermoplastic resin UL 94V-0, normally used for applications in a maximum ambiente temperature of 125 C. The special versions for use with a maximum ambiente temperature of 180 C are made of PPS. 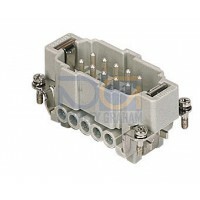 Different conductor connection techniques are available: screw, crimp or spring connections. The contacts are in silver or gold plated brass. Inserts are numbered on both sides by laser printing or moulded. There is a large number of versions of inserts selected on the basis of the rated voltage (from 50V to 5000V), the rated current (from 5A to 200A max), the number of poles, the different load combinations required (power and signal poles within the same insert). Inserts are approved in accordance with the approval marks including UL, CSA, DNV-GL and EAC. For certifications of each model/series refer to the summary statement (pages 18 and 20) and the respective pages of this catalogue.